We left Seattle over a year ago with a brand new stays'l from the inestimable Port Townsend Sails. Ever since then, we have been trying to house it properly. Our stays'l is one of just a couple of hank-on sails that we have on board; that being the case, we wanted to stow it in a deck bag from which it could be readily deployed. Our saga begins in La Paz, Mexico, where we made the first of three foredeck bags for the stays'l using a pattern from a canvas worker's book. We used a pattern for a 200 sq. foot working sail. Since our sail is only 160 sq. feet, we figured the finished bag would fit fine. Our first attempt looked nice but after all our hard work, didn't fit the sail! In the end, neither the length or sail stack height dimensions fit our stays'l. 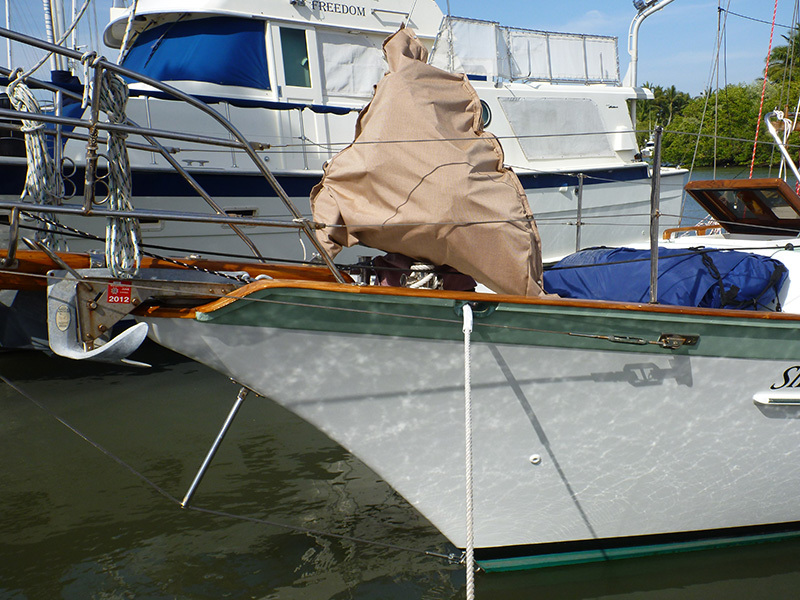 Part of the problem is that our stays'l was built to be as "bullet proof" as possible so the fabric is much heavier than most sails of that size, and the reinforcements at the clew for example, are also far heavier than typical production loft sails. 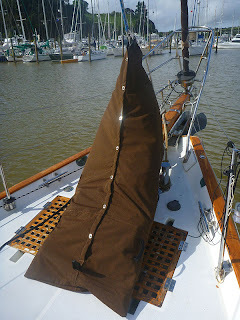 We decided to either use the first sail bag for our storm stays'l or recycle the fabric into another sewing project. In Nuevo Vallarta, just before setting off on our Pacific crossing, we made a second foredeck bag. This time we used a pattern from an online vendor of sewing materials, Sailrite. Our second sail bag turned out ugly as sin but just fit the sail (if you worked hard at it.) We were a bit disheartened after our experiences making two sail bags, neither of which we were satisfied with, and realized we should have made our own pattern instead of using pre-printed plans from a book or the web. In practice we found the second bag was more trouble than it was worth as it required the sail to be folded perfectly to fit . We finally resorted to removing the stays'l after each use and stowing it in its original bag. One of the projects that Patrick has completed in New Zealand while I've been in San Diego is to make the third iteration of our foredeck bag. Patrick relied on a tried and true method to make a pattern which he had successfully used on his former trimaran, Bacchanal. Patrick also added some nice detail work to the sail bag, including chafe protection where the bag comes in contact with the stay. 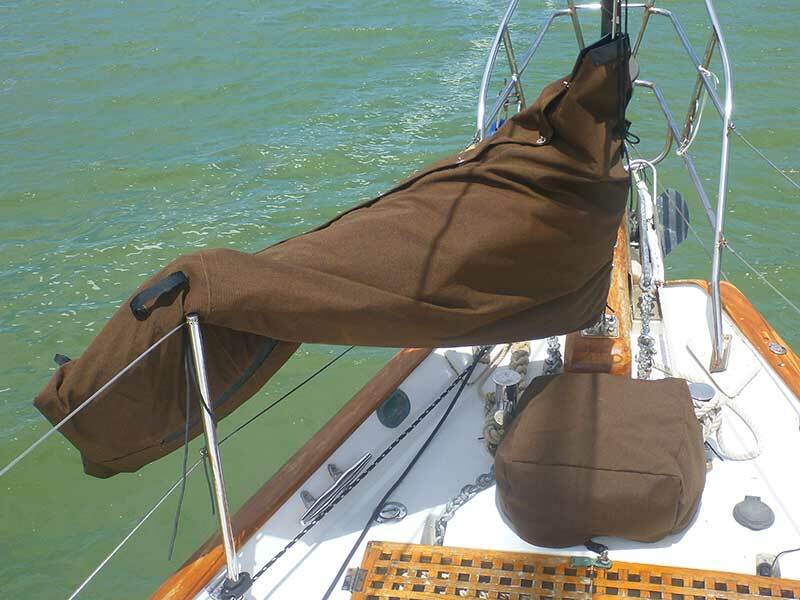 Our new foredeck bag can be swung up and out of the way when using the windlass or for routine maintenance on the bow. 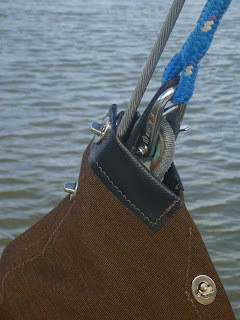 There are a few lessons we will remember from our experience making our foredeck bag. First, even a pattern that appears reasonable may not fit the sail at hand, and we should always make our own measurements and create our own pattern. Second, the trite but true adage that if you persevere at something, you will eventually get it right, also held true in this case. Finally, we realized that we weren't wrong to go off on passage without everything on our project list finished and completely checked off to our liking. 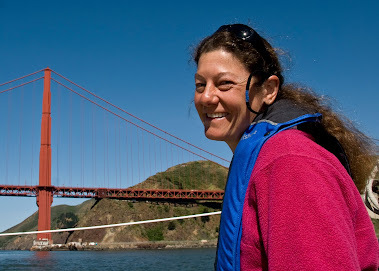 Although it's important to be able to distinguish between which projects are essential to the operation of the boat and which are simply "nice to do," in the end, leaving with some projects left to do along the way beats the paralysis of never leaving. ....from the crew of Silhouette to you and yours. Patrick and I brought in the new year from two different places. Patrick saw in the new annum from aboard Silhouette, still in Opua, Bay of Islands. 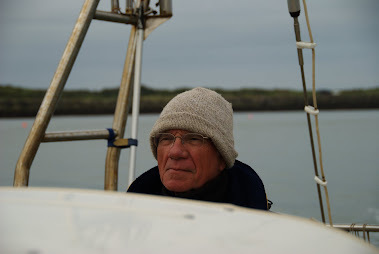 His first act of 2013 was to move Silhouette to her new mooring on New Year's Day, because the former occupants of the mooring we rented in December had returned. When I return to New Zealand at the end of January, we will move Silhouette yet again---this time to Whangarei---for a haul-out. I (Kirsten) welcomed the new year a day later than Patrick, from San Diego, where I've been spending time with my family. I watched the ball drop in Times Square on television at 9 p.m. Pacific Standard Time: I'm still observing cruiser's midnight! Watching the celebration and festivities in Times Square, it was impossible not to let my thoughts wander to the neighboring state of Connecticut and the town of Newton. I imagined that the tragedy there was too fresh for its inhabitants to put a brave face on the new year, and I wondered if any lasting changes would come from the national debate sparked by the nation's most recent school shooting. One thing I haven't missed while cruising outside the United States is the media's endless parade of debilitating violence-related news. Reading the retrospective articles and viewing the year-end images from various newspapers and online sources, I also became aware of several passings and extraordinary events that had escaped my notice while voyaging this past year. While we lost a plethora of musical voices in 2012, two who had passed unbeknownst to me were the talented Doc Watson and Levon Helm (formerly of The Band.) I also learned that I had missed Felix Baumgartner's spectacular feat of stepping off a space-craft to complete a 24-mile freefall through the Earth's atmosphere---breaking the speed of sound---and safely landing in New Mexico! What makes one brain wired for genius, another for sociopathological behavior? The human brain, like the seafloor, is largely unknown. What are the causes of mental illness and how prevalent is it in our society? These are easy questions to ask but not to answer. As I turn the first page of 2013, I find I have more questions than answers.